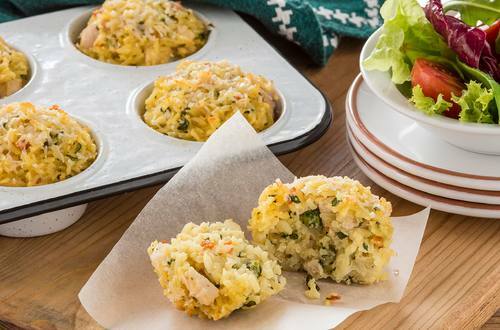 Enjoy a light treat this summer with our chicken & basil rice cakes recipe. Easy to prepare and ready in just 40 minutes, our summer snack couldn’t be easier. 1 1. Preheat oven to 190°C and grease a large 6 hole muffin pan. Place chicken on a baking tray and cook for 15-20 minutes until cooked. Allow to cool slightly before dicing. 2 2. While chicken is cooking place Rice and water in a saucepan and bring to the boil. Cover and simmer gently for 10 minutes. Stir, recover and stand for 2 minutes. 3 3. Stir through eggs, chicken and basil. Divide between baking pan, sprinkle with cheese and bake for 15-20 minutes until golden brown. Serve with salad.